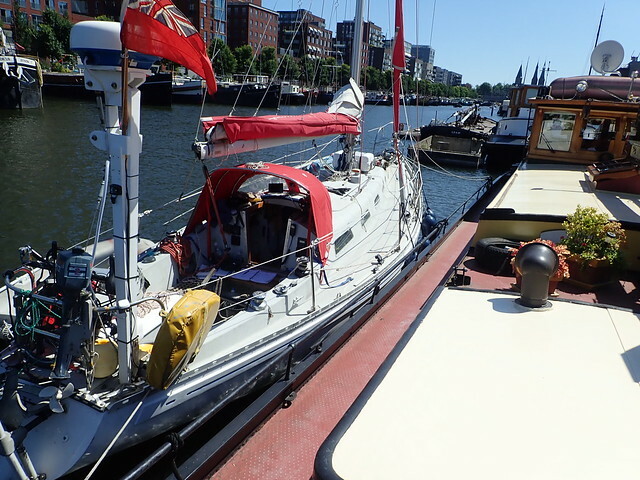 I'll give a list of dates presently, but from Terschelling we spent a night at anchor in the Waddenzee (see 'A Night at Sea', from Riddle of the Sands). Then to Den Oever and through the locks. The Dutch are very generous with their locks and canals - with the exception of a small (total about 20 euros) charge for going through Haarlem everything was free. The marinas were also cheap, and there were places where I could tie up for nothing (often in town centres). Two days in central Amsterdam in the Marina het Realeniland (in the Westerdok) only cost 50 euros with power. It was quaint rather than fully serviced, but very pleasant. They don't have many places - I think I got the only one, and had to raft up on the first night. If you want to follow me in, phone ahead! The route into the Westerdok is a little bit hair-raising - small bridges and Amsterdam canals - but very atmospheric.